With Risk It! to hand you will be sure to know which risks could affect your event …and how to deal with them. This very practical book is full of tips and hints to ensure that your event is a success and your business grows. It is written in a chatty style. There is no jargon and no barrier to entry so anyone can read it with ease. Risk It! is written with a very practical application and the reader can instantly start putting the techniques outlined into use straight away. As a bonus the size of the book means that it can be easily carried around and will not weigh you down. It is about 120 pages in length and features techniques that you can use immediately in your event risk thinking. There is some inclusion of insurance but without any jargon to get in the way. 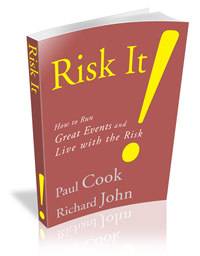 Paul Cook and Richard John are the proud producers of Risk It!